Warren Buffett says that in 10 years, the retail industry will look nothing like it does now. "The department store is online now," the billionaire investor said Saturday at Berkshire Hathaways annual meeting in Omaha, Nebraska, as Business Insiders Bob Bryan reported. "I have no illusion that 10 years from now will look the same as today, and there will be a few things along the way that surprise us," he said. "The world has evolved, and its going to keep evolving, but the speed is increasing." Charlie Munger, the vice chairman, chimed in, saying, "It would certainly be unpleasant if we were in the department-store business." Buffett isnt just sounding off about the demise of traditional retail — he has been pulling his money out of the industry as well. Berkshire Hathaway fired a warning signal for the retail industry in February when it sold off $900 million of Walmart stock, choosing instead to invest billions in airlines. The sale left Buffett with nearly no shares of Walmart at a time when worlds largest retailer is investing billions in the battle to catch up to Amazon. In an interview with CNBC after the sale, Buffett said retail was "too tough" an investment, especially in the age of Amazon. 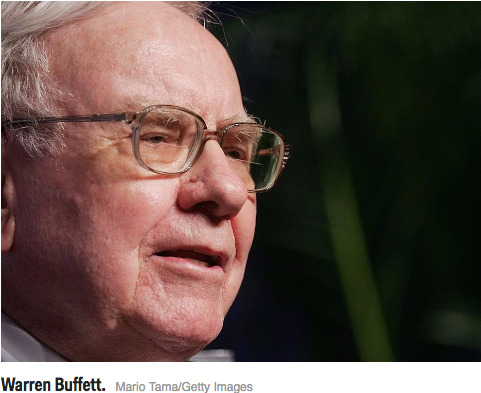 "I think retailing is just too tough for me, just generally," Buffett said. "We bought a department store in 1966, and I got my head handed to me. Ive been in various things in retailing. ... I bought Tesco over in the UK and got my head handed to me. Retailing is very tough, and I think the online thing is hard to figure out." Buffetts comments come at a time of massive upheaval for the retail industry. US retailers have been closing stores and filing for bankruptcy at rates not seen since the recession. 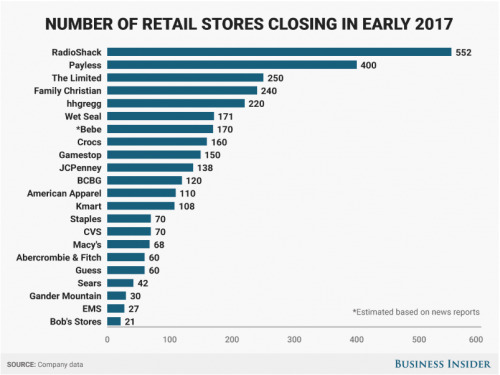 Brick-and-mortar retailers have announced more than 3,200 store closures so far this year, and Credit Suisse analysts expect that number to increase to more than 8,600 before the end of the year. For comparison, 6,163 stores shut down in 2008, the worst year for closures on record. Stores are closing because of the rise of e-commerce and shifts in how people spend their money. Shoppers are devoting bigger shares of their wallets to entertainment, restaurants, and technology and spending less on clothing and accessories. Department stores like Macys, Sears, and JCPenney have been hit the hardest by these trends — since 2001, department stores have lost half a million jobs. Buffett isnt the only investor who thinks these trends are permanent. The asset management company Cohen & Steers released a report last week supporting that theory. "We see this retail weakness, which is occurring despite a relatively healthy economy, as part of a permanent evolution in how and where Americans spend their money," the firm, which manages $58.5 billion in assets, said in the report. "We expect the paradigm shift taking place to dramatically alter the retail landscape, with potentially significant implications for real estate investors."